Did you know that the “18 Infamous Golf Holes” was on Tour earlier this summer. the same weekend as the Quicken Loans PGA Tour event at Congressional CC. at the Ritz Carlton Georgetown. also an artful golf champ. Join us as Bud Chapman discusses his artful philosophy and the creation of this whimsical golf series. An avid golfer, having won several state tournaments, Bud is a member of the Minnesota Golf Hall of Fame and also personally acquainted with several iconic golf legends. At the age of 91, his worst handicap is the 4.2 handicap he still carries and still continues to paint a lively lifetime tapestry. 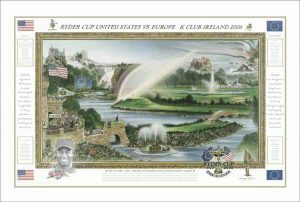 Besides “The 18 Infamous Golf Holes”, Chapman was also commissioned for other works, commemorating assorted tournaments, the U.S. Seniors Open, the Solheim Cup, and especially fond of the tribute of the 2006 Ryder Cup designated as gifts for the USA Team by Captain Tom Lehman. While Chapman looks forward to the Ryder Cup USA return at his home course Hazeltine National GC. TPK Golf CEO Vlad Gribovsky is delighted to be representing this 35+ year-old historical collection of whimsical golf art. This unique series will enchant collectors and engage any golfing audience. Other efforts include cultivating an international audience and possible gallery show in London or China. 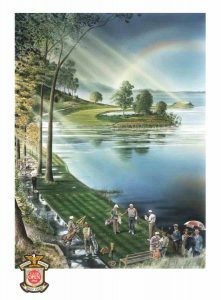 “The 18 Infamous Golf Holes” is a charming historical collection for the country club or for corporate art, also now available for the discerning collector. Original gicleés from this series are signed special limited edition available through TPK Golf.